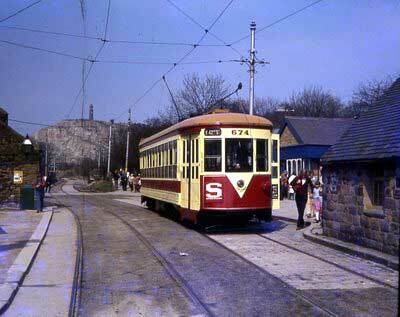 An undated photo (but either 1979 or the early 1980s) of New York 674 in operation at Crich at the Town End. New York 674 was built in 1939 by the Third Avenue Transit Company. The tram was designed for One-Man-Operation, and to seat 46 passengers within a large salloon. It is designated as a "Z" class tramcar. After World War II, many European Countries were on their knees to the point of exhaustion. One such country was Austria, and so 674, along with a further 41 similar cars, were transported to Vienna as part of the American Marshall Aid programme. It was renumbered to No. 4225 in the Wiener Verkehrsbetriebe system, and ran up to 1969 when it was withdrawn. At that time, the British Ambassador to Austria formally recieved the tramcar prior to sending it to Crich, where it arrived in April 1970. It ran at Crich for 6 years in it's Vienna condition, but with a minor alteration in that the pantograph was on a raised deck so that it could reach the overhead wires, which were designed for double-deck tramcars. In 1979 the tramcar was restored to original New York condition, with twin trolleypoles, and ran for a few more years. More recently 674 has been part of a display explaining the story of the PCC Tramcar, or which 674 is the only American example at Crich, along with The Hague 1147. It remains there to this day. A fact that is not widely known about 674 is that it was actually considered as a static exhibit at the 1988 Glasgow Garden Festival, where it would have had it's wide saloon put to good use as a major sponsor's hospitality venue. 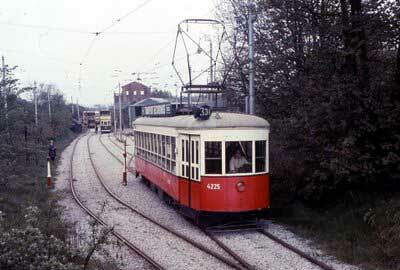 An extra view of the tram when it operated as Vienna 4225 in May 1975 at Crich.